John Gilbert is a graphic designer, illustrator and dedicated fine artist. 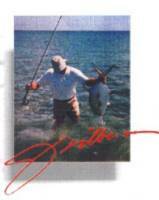 His paintings include the "Angler's Collection" which is a series of; handpainted serigraphs of Florida's game fish. Each image is initially hand-drawn using pen and ink, then screen printed on handmade French papers and finally handpainted using transparent watercolors and inks. Other watercolors are native Florida scenes including historic sites, buildings and flora. Hiswork has been selected as the "Featured Artist" for the Maitland Art Show and in the annual Artists Stidio Tour which benefits the Habitat for Humanity.